Cloudy with rain in the morning...then scattered thunderstorms in the afternoon. High 67F. Winds S at 10 to 15 mph. Chance of rain 80%..
Cloudy. Low 52F. Winds SSE at 10 to 20 mph. If you were to play a word association game, when you hear, “I have a background in engineering and business at a Fortune 500 company,” you might not think, “volunteer at the local mental health agency.” And if you did that, you would miss the incredible volunteer contributions Robert Harvey has made to our partners at Washington County Mental Health. Harvey was recently recognized at WCMH’s 50th-anniversary celebration for his contribution to the organization over the past 17 years. His volunteer contribution on the board of directors there is a career in itself. He is the treasurer of the board, a role requiring an engineer’s meticulous attention to detail because of both the size of the organization — WCMH employs nearly 700 people in our region and serves many more community members — and also because the breadth of their funding sources and services. Harvey is also on several volunteer committees at WCMH and regularly meets with the executive director, the director of finance, staff and management regarding health insurance benefits structure, financial performance, service delivery and staff workplace issues, and acts as a link to the board of directors. His enthusiasm for administrative and logistical topics is contagious and demonstrates the immense value of the volunteer work he does. It is also, likely, one of the reasons WCMH nominated him for Volunteer of the Month. His enthusiasm, focus, and attention to detail translates to a job well done: Harvey is not your average volunteer and he is just as dedicated to his work as someone hired for the job. His career prepared him well for his retirement volunteer “job.” As an engineer, his career contributions even include a part in the creation of the lunar module in 1967-68. He is an engineer at heart with the ability to focus on the details while keeping in mind the larger goal. 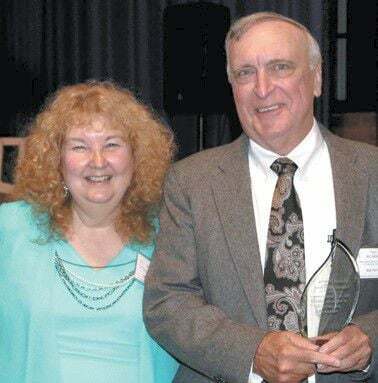 Harvey’s introduction to Washington County Mental Health’s services started when he and his family moved back to his wife’s home here in central Vermont after his retirement from that Fortune 500 company and decades as an engineer and businessman. His family’s move was not without challenges. His son is on the autistic spectrum and struggled with the changes of moving to a new, unfamiliar place. After his son had several crises, Harvey’s family was connected with WCMH to work with a case manager. He and his family were so grateful for the support and resources offered by the agency that helped their son transition into his new home. In particular, the case manager assigned to their son made a huge impact on Harvey. He described her effort as “really going the extra mile. She was so effective at getting our son into a support program and getting him everything she could to help him better transition into the community.” It was she who suggested that Harvey consider joining the board of directors, so he wrote a letter and was invited to join. That was 17 years ago. “Bob is an absolute gem. We just presented him with our Community Support Award for 17 years of dedication to our staff and clients through service on our Board of Directors as well as numerous committees. This is an award given for keeping the flames of hope and support alive. We are incredibly fortunate to have Bob on our team,” said Washington County Mental Health Executive Director Mary Moulton. When asked what the award means to him, he spoke about WCMH’s “staff and their commitment to the community. They live their work every day.” Harvey is proud that his volunteer contributions support the staff and the work the agency does, allowing more people to focus on the people in the community who they are helping. He said, “All the little details make the whole thing work.” Harvey plans to continue to dig into all of the details at WCMH, and to continue to support the work they do, as well as honor their hard work by matching that with his effort as a volunteer. And after 17 years, he’s just getting started. If you are interested in learning more aboutWCMH’swork,gotowww.wcmhs.org. The Volunteer of the Month is a feature compiled by the Green Mountain United Way, focusing on the contributions of local volunteers whose work benefits local nonprofit organizations in Green Mountain United Way’s service territory. For more information, or to nominate a volunteer, go to www.gmunitedway.org/volunteer-of-the-month.